The Westfield Chess Club wishes its members and patrons the happiest of holidays. We will be closed on December 28th. Our next event will be the January 4th Quads. Errol Singh won the Westfield Chess Club's annual Holiday Blitz tournament, which took place on Sunday, December 21st and featured 24 participants. To view a crosstable of the event, click here. On Sunday afternoon (12/21), the Westfield Chess Club is having its annual Holiday Party and Blitz Tournament. The club will be providing pizza, snacks and beverages. Members may bring food, as well. Alcohol is not permitted. 12:30 p.m. - Staff Meeting. 1 p.m. - Members' Meeting (should be brief) followed the party. Non-rated. 7-SS. G/5; d2. Register: 3:45-3:55 p.m. Rounds: 4:00 p.m. then ASAP. EF: Free. 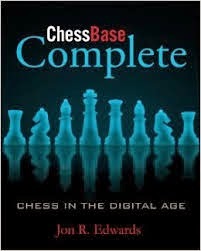 On Sunday, November 23, the Westfield Chess Club will be hosting a presentation by, & book signing with, Jon Edwards, author of ChessBase Complete: Chess in the Digital Age. The event will take place from 12:30 to 2:15 p.m, in room 109 the Kellogg Room, prior to the Westfield Quick Swiss. 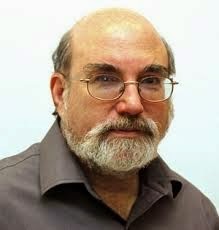 Jon, a 2-time U.S. 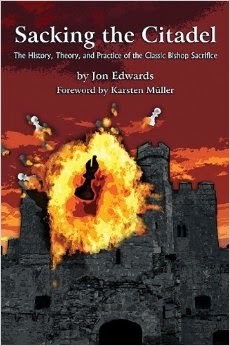 Correspondence Champion, has written many other chess books including Sacking the Citadel: The History, Theory and Practice of the Classic Bishop Sacrifice. A view from the directors' post. LM Peter Radomskyj (right front) & Michael Yen (to Peter's right) tied for 1st in Section 1. Michael surpassed 2100 in the process. David Liu (right front) won in Section 2. Baron Wu (near the center window, facing right) was Section 3's winner. Derek Clasby (right front) claimed the top spot in Section 4. Eric Wu (green shirt) swept Section 5. He was the only player to go 3-0. Tomorrow's Westfield Octos will be held in the Kellogg Room on the YMCA's 2nd Floor. Registration will be from 1:15 to 2:00 p.m. Play will begin at 2:15. From L-R: Ramneek Singh (1st place), John Cartier (3rd), Piush Sarkar (4th) and Nick Rizzo (2nd). Final Open Section Standings, in tie-break order. Congratulations to the 16 trophy winners and thanks to all 34 who participated. Our next Scholastic event will be on January 18th, 2015. Above, from L-R: Dillon Shelton (2nd place), Thoshan Omprakash (1st), Ronak Bhatia (3rd), Albert Yao (4th place) and Alexander Chen (5th). Final U1250 Standings, in tie-break order. From L-R (with trophies) : Aneek Mahajan (5th place), Anish Reemala (3rd), Michael Pylypovych (1st), Johnson Lin (4th) and Dylan Volinski (2nd). Final U750 Standings, in tiebreak-order. Ramneek Singh (1763), Thoshan Omprakash (1208) and Michael Pylypovych (624) were section winners in Sunday's Westfield Fall Scholastic, which featured 34 participants. The full list of trophy recipients and some additional photos will follow. Lev Zilbermints won the Westfield Championship today by going 1.5/2 in the last 2 rounds. LM Peter Radomskyj and Ilya Zhurbinskiy tied for 2nd. Michael Yen, Errol Singh (both U2200), David Zhurbinsky (U2000), Ramneek Singh, Sam Chatsky (both U1800) and Nicole Yen (U1600) won class prizes. For a complete list of participants, results, photos and final standings, click here. Lev Zilbermints, Michael Yen and Ryan Feng lead the 2014 Westfield Championship at its midway point. LM Peter Radomskyj and David Zhurbinsky are a half-point back. On September 21 & 28, the Westfield Chess Club will be running its annual Club Championship. As in recent years, the event will be a 4-round Swiss with an 85+5 (delay) time control. The entry fee is $20. Westfield CC membership ($40/year) is required. For prizes, registration & round times, etc., click here. To avoid competing with the recently re-scheduled, $18,000 Boardwalk Open (originally slated for 10/25-26), the Westfield Chess Club has pushed its Westfield Open back to November 9th and moved its 11/9 Quads up to November 2nd. Note: The September issue of Chess Life will show incorrect dates for the aforementioned events. 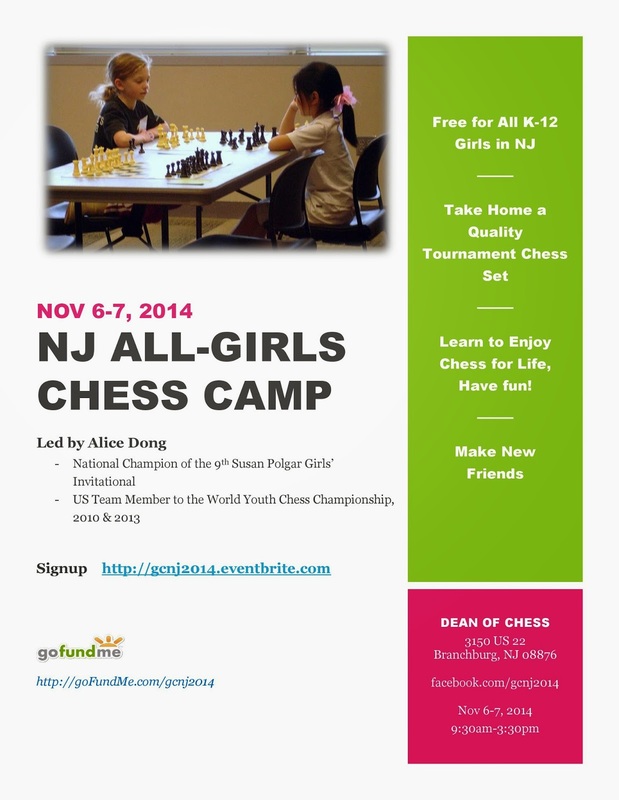 On Saturday, November 6th & Sunday, December 7th, Alice Dong will be leading a free, NJ All-Girls Chess Camp at the Dean of Chess Academy in Branchburg. The Westfield Chess Club will be closed on Sunday, August 31. Our next event will be the September 7th Quads. Yesterday's Westfield Quads were held in the spacious Kellogg Room, on the YMCA's 2nd floor. Being able to walk around, view the games and not have everyone crowding the TD's table was a treat but we will be returning to our usual location on September 7th. From L-R: Dylan Raphael (Honorable Mention) and Ronak Bhatia (4th place). Congratulations to the 20 trophy winners and thanks to all 44 who participated. Above, from L-R (with trophies): Ashwin Balaji (Honorable Mention), Max Gorbaty (1st place), Derek Clasby (2nd), Aziz Kodirov (3rd), Aayush Ajith (Honorable Mention) and Dina Brustein (5th). Not Pictured: Jason Lu (4th) & Dillon Shelton (Honorable Mention). The happy 2nd place finisher creating a photo op. From L-R (with trophies) : Ethan Chan (5th place), Jack Silver (3rd), Felix Liu (4th), Ashwin Kaliyaperumal (2nd) and Albert Yao (1st). Amey Pasarkar (1752), Max Gorbaty (1172) and Albert Yao (665) were section winners in Sunday's Westfield Summer Scholastic, which featured 44 participants. Effective July 27, we will be using the most recent rating list to pair our events, instead of the current month's list. Thus, the ratings we use in the latter half of a month will be more up to date and representative than they are now. In addition to the July 27th Quads, the change will affect: the August 24th Quads, October 19th Octos, October 26th Quads & whatever we decide to run on November 23rd, November 30th, & in late December. The no rating-request policy will continue. Starting on June 22, our regular hours will be 1:15-7:45 p.m.
For most events, our official registration period will be 1:15 to 1:45 p.m. From 1:46 until 2:00 we will list-check and do a final confirmation via roll call. Once the roll call ends entries will be closed! From 2:01-2:14 we will divide the players into sections and make the 1st round pairings. Play is scheduled to begin at 2:15 p.m. Rounds 2 & 3 are slated for 4:00 & 5:45. We expect quads & octos to end around 7:15 p.m. & be submitted for rating by 7:30. The thrown-together team of NM Mauricio Camejo and Jonathan Qi won yesterday's quick-rated, novel and poorly attended Dynamic Duos. The Westfield Chess Club has scheduled a Quick Swiss for May 11th, Mother's Day. From L-R: Jayadeep Boya (5th place), Albert Tang (Honorable Mention), Ramneek Singh (2nd), Michael Berrios (3rd). Not pictured: Aaron Jacobson (1st), Sasha Prystupa (4th). Congratulations to the 16 trophy winners and thanks to all 45 who participated. Above, from L-R: Eric Wu (5th place), Derek Clasby (4th), Max Gorbaty (1st), David Zhao (3rd) and Aziz Kodirov (2nd). From L-R: Pranav Sitaraman (5th place), Isaac Tu (4th), Dina Brustein (1st), Benjamin Ma (3rd) and Simon Pearl (2nd). Aaron Jacobson (2146), Max Gorbaty (1050) and Dina Brustein (730) were section winners in Sunday's Westfield Spring Scholastic, which featured 45 participants. On April 13 (Palm Sunday), the Westfield Chess Club will be running its Spring Scholastic tournament. You can still register at the advance rate ($15 for club members and $20 for non-members) by sending us an email. If your child needs to join the USCF, please do so before Sunday or arrive early. Effective immediately, we will no longer accept rating requests from players or their parents. Published ratings for the current month will be used for all tournaments, unless we state otherwise. Where allowed by rule, the Chief TD may assign a rating. Errol Singh and Sam Chatsky won the Westfield Quick Swiss held on Super Bowl Sunday. Mauricio Camejo, Aaron Jacobson and Tom Polese tied for 3rd. Jonathan Qi and Ramneek Singh earned the U1700 prize. Riaan Sheth and Anurag Shetty had the best U1000 scores. With a larger than expected turnout, we added $100 to the prize fund and 2 class prizes. From L-R: Jayadeep Boya (1st place), Jonathan Qi (3rd), Nikhil Arayath (4th), Yuvanshu Agarwal (5th). Not pictured: Brandon Ng (2nd). Congratulations to the 15 trophy winners and thanks to all 41 who participated. Our next Scholastic Event will be on April 13th, 2014. Above, from L-R: Nikhil Kalyanraman (1st place), Sujeeth Shanmugam (2nd) and Warren Bu (5th). Winson Zhu (3rd), at right, was absent when the first photo was taken. Not pictured: Aayush Ajith (4th). From L-R: Warren Sunada-Wong (5th place), Bhaskar Jain (2nd), Dina Brustein (1st), Vpharri Ramanujan (4th) and Navya Thatigutla (3rd). Updated 1/21 @ 1:50 p.m.
Jayadeep Boya (1625), Nikhil Kalyanraman (1023) and Dina Brustein (280) were section winners in yesterday's Westfield Winter Scholastic, which featured 41 participants. A reminder: Starting today, the entry fee for our Quads & Octos is $20 for Westfield CC members and $25 for non-members. The prize-fund for each quad has been increased as well, to $60.